Lemon Blueberry Tart - Do You Know The Muffin Man? Notes: This is a variation on the Cornmeal-crusted Lemon Tart recipe in her book. The crust is crumbly because it's made with cornmeal and is just patted into the pan; it had a lot of cracks after baking. I cooked the filling in a glass bowl over simmering water; usually, I use a stainless steel bowl which seems to be a bit faster. Coarse cornmeal made for a very crunch-ewy (a new word!) crust and it was too thick on the bottom (my pan was 10.5"): I didn't like it. 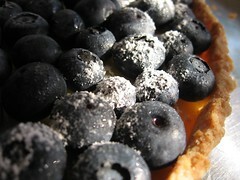 But the filling is very tart and is a good match with the blueberries.